Zac and Heather Lytle moved to Oak Cliff from Austin, so Heather could begin medical school at UT Southwestern. Though they both are casual commuter cyclists, Zac is also big into the racing scene, and will often pack up his higher end road bikes to head out to various races around the world where he races at the amateur elite level. Zac studied Modern Urban Planning at the University of Texas in Austin, and was a founding member of BFOC. His tireless work in championing bicycle infrastructure in Dallas was the match that lit the fire in our organization’s earliest efforts to mobilize. On a sad note, Zac and Heather are about to leave us so Heather can continue her Medical School training at UNC. Before heading off to the East Coast, they’re planning a vacation to Morocco and Amsterdam. While in the bicycle haven of Holland, they’ll be meeting up with other BFOC members to take in the sites and report back. We’ll be sure to highlight that trip on the site soon. We live in the King’s Highway Conservation District. Zac – I picked up the one you see from Craig’s List. It’s a JC Penney single speed that I added a front basket to. It’s one of 7 bikes I own…I have a bad habit of impulse buying cheap bikes from Craig’s List. Mine range from high-end Carbon Fiber road bikes, to tandems, cruisers, and cycle-cross bikes. The JC Penney bike is my beater that I use to cruise around the Cliff. Heather – I picked mine up for $50 on Craig’s List. It’s a Puch Metor Luxe 3-Speed, with a Stermey Hub. I got the basket from Cynthia’s Twigs online and tailored my own lining into it. What are your favorite local spots to ride to? Zac – We just had a romantic anniversary picnic ride to Lake Cliff Park that was a lot of fun. You can often find us riding to Eno’s in the Bishop Arts District where I’m usually ordering Ten Fidy beer in my personalized mug. Heather – My favorite places to ride are the one’s that give me the BFOC discounts! 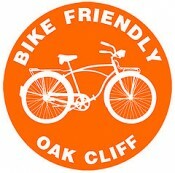 Thanks for helping to make Oak Cliff a better place to live, work and play. It’s been a real joy and y’all will be truly missed. We’ve had such a great time living in Oak Cliff and are so much sadder to leave than we ever dreamed possible when we first arrived in Dallas. We’ll miss all of the awesome BFOC’ers that we’ve had the pleasure of getting to know and love! Thanks for the bike routes and lanes. Since moving here 3 years ago from Boise ID, we have noticed that there wasn’t any place to ride safely. Also, I know this has nothing to do about bikes, but is there any way to get more info on Oak Cliff Disc Golf Club. We can’t find anywhere to play. Thanks its appreciated. Did someone get back with you regarding your disc golf question?